Death has traditionally been portrayed as the spectre of doom, something to be feared and avoided, not mocked or belittled. In this reversal of characterization, he becomes almost an object of sympathy, his rectus grin replaced by a “taken aback” expression, which seems all the more fitting. I love toying with these kinds of ambiguity, forcing the viewer to take sides as an active participant. The only hints I hand out are crumbs that lead the viewer in their own direction of exploration and comprehension. The Shoulder Devil is often a symbol of the troubled conscience, the darker foil that in some yin yang balance counters that of the Shoulder Angel. As presented here, the Shoulder Angel should be the Laughing Man and since we have established that “he’s no angel”, then perhaps the devil is “no devil”. His expression echoes the disconcerted face of Death and the disarmed Shoulder Devil seems to be rendered impotent with his diminished scale overwhelmed by the presence of the Laughing Man. Death’s head again gets echoed in the poison’s skull and crossed bones symbol. The pernicious liquid dissipates in a threatening vapour, consistent with the theme of death on the left side of the painting. The Kool-Aid coloured liquid establishes a dichotomy of repulsion and attraction, drawing the viewer to its visual appeal and repelling them with its warning label. Like the Judgement card in the tarot deck, the graveyard is often the setting for the events of the Day of Reckoning, where the dead are held accountable for their earthly actions. The grave markers bear witness to the impending doom of the final days playing out on the left side of the painting with everything tilting toward one giant opened grave that Death merges with at the bottom corner. The cosmic forces at play in the upper portion of the painting represent the natural cataclysm looming over us each day. The Moon strains to spew out a giant fireball that nonchalantly plunges toward earth. Even if the Laughing Man has distracted Death, the indiscriminate forces of nature will finish his job for him. I often use Humpty Dumpty in a way that makes him a placeholder for humanity. He is fragile and susceptible to the elements and situations that he finds himself in. He is the existential king of nursery rhymes and his daring and courage are reflected in the simplest of actions since his frail shell could fracture from the slightest bump. He ironically flails a hammer, but he hits the nail on the head—the head of Death. Like the last nail in the coffin, the final blow, he boldly attempts to finish off death. His hideous grin repeats that of the Laughing Man and the cannibalistic fried egg in his left hand makes him less than a sympathetic character as well. On the far right is a pantomime of life, players rolling the dice and chance dictating the outcome. There is the power/class struggle, the leader being self absorbed in his own good fortune, oblivious to the ones left behind and the downtrodden lashing out in frustration. Sensory input is also left to chance as the game leads inevitably towards Death and the opened grave on the far left. As a Canadian artist, I feel like I must do my best to reach a Canadian audience. I hope this series of analytical explanations of my paintings helps broaden the awareness of my art in Canada and eventually beyond. 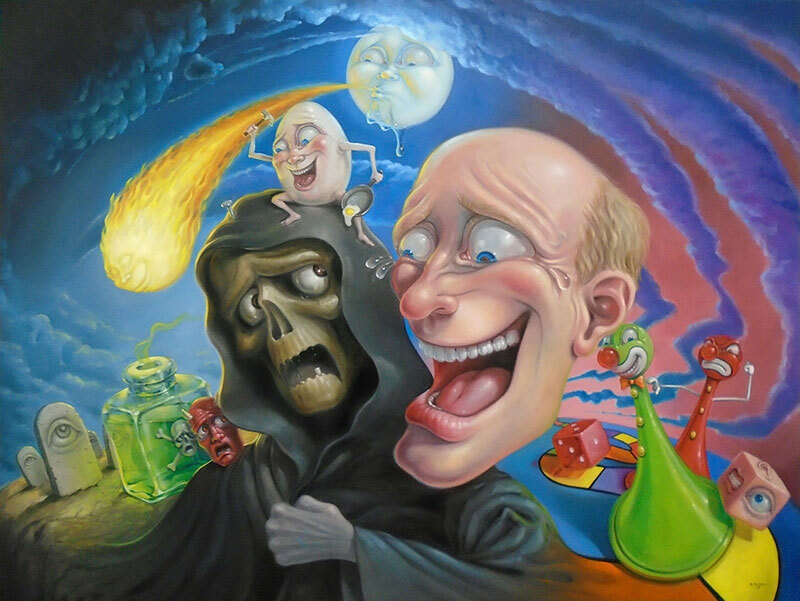 This entry was posted in Canadian art, Canadian Artist, Canadian Surrealism, Humpty Dumpty, Pop Surrealism, Surrealism and tagged canadian artist, canadian surrealism, humpty dumpty, laughing in the face of death, pop surrealism, stephen gibb. Bookmark the permalink. Both comments and trackbacks are currently closed.